When the power station reports a massive power drain pinpointed to the Mansion of Professor Crumpet, Inspector Crikey investigates, only to discover a radical new invention.... the Virginity Restoration Machine. 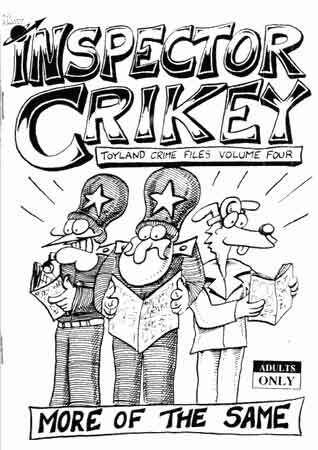 Inspector Crikey takes a few days off, only to find himself on a quest to mine pornographic material in the old hills of Toyland. Inspector Crikey catches an egghead alien responsible for constructing reality outside of everyone's eye-shot, and interrogates him for the answers to life itself. This story was the basis for the short film 'Got One!' made in 2003. When Constable Phaque resigns to join the moonies, Inspector Crikey investigates, only to discover an evil scam by his old enemies, the Bumnivores ! Warning: pretty much Adults Only stuff, ...not that bad really... just don't show your mum !